August Camp is a volunteer-run summer program of the Appalachian Mountain Club. 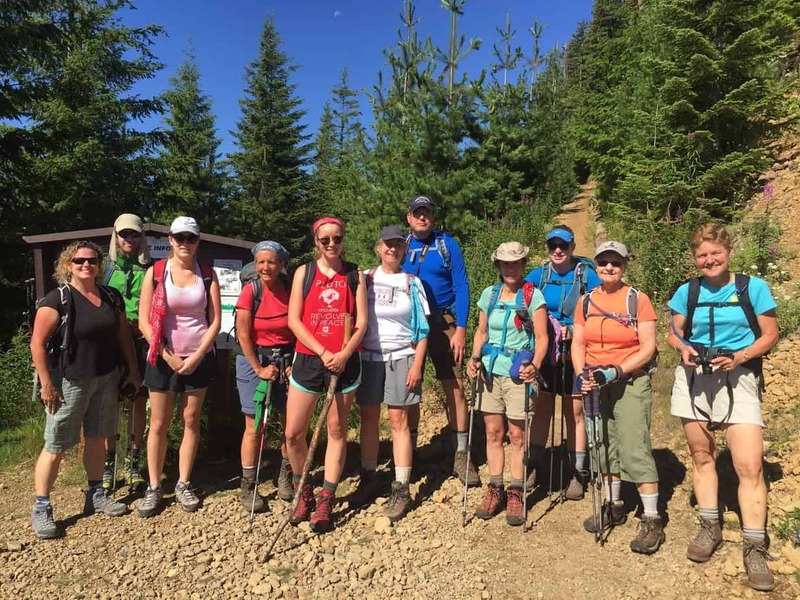 It offers four one-week sessions of group hiking for adults in or near National Parks, Forests, and Wilderness areas, chiefly in the Western US. 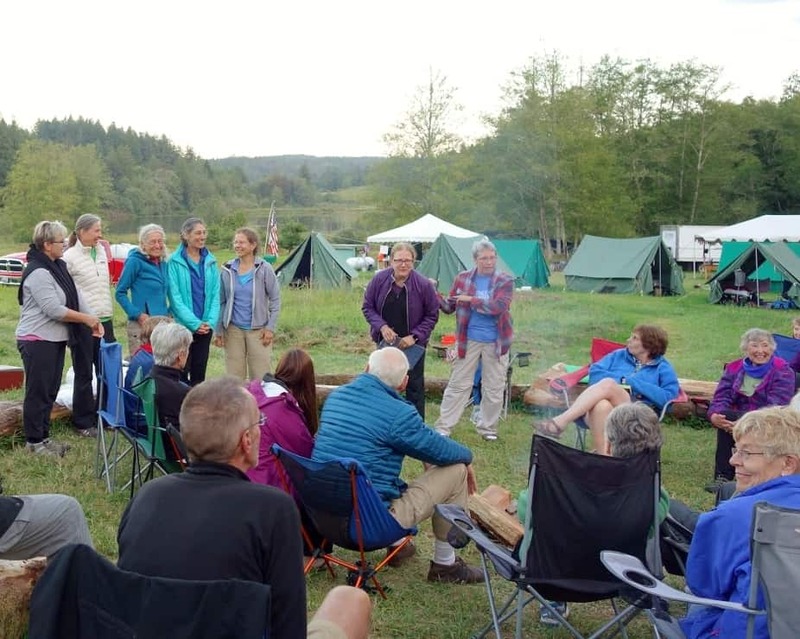 Each summer August Camp sets up a tent community for about 60 people in the chosen area, which serves as a base camp, with most activities being within an hour’s drive. 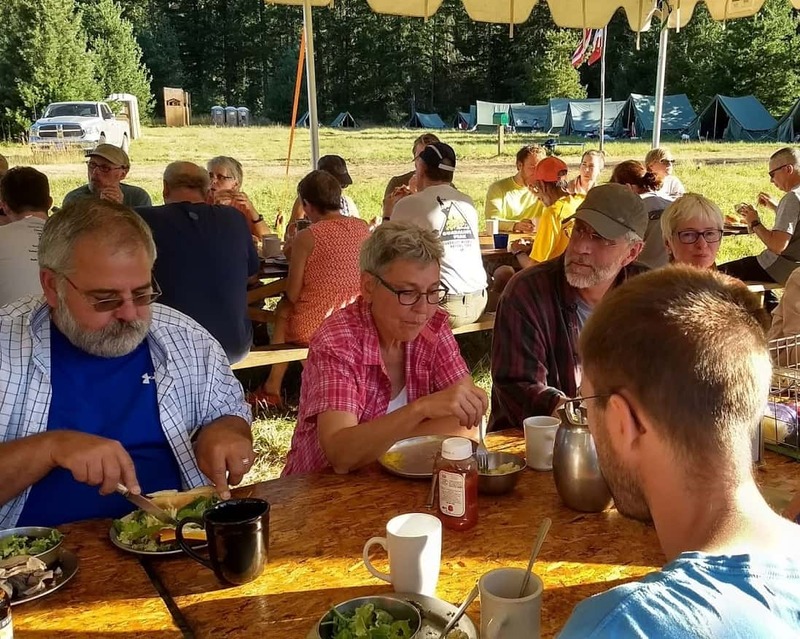 Participants sleep on cots in 2-person tents, and are provided three meals a day, transportation to the day's activities, and an evening campfire program. August Camp is planned and overseen by volunteers. When camp is in session, a hired staff consisting of a camp manager, cook, and “croo” of young adults run day-to-day operations. Croo members are often students saving money for their school expenses. Tipping the croo is greatly appreciated. Day hikes are led by volunteers who are certified in Wilderness First Aid and CPR, and have undergone AMC training in group leadership. Hike and activity leaders are not paid guides. Hikes and other activities at Camp are designed to be a group experience. We offer hikes at several different levels to accommodate as wide a range of experience and expectations as we can. Our trained hike leaders will do their best to ensure that each group has a rewarding and safe experience. You can help by choosing a suitable level of activity, staying with the group throughout the day, and taking responsibility for your own safety. Groups are generally limited to 12 people, so we don’t anticipate a very wide range of abilities on any hike. That said, we set out as a group and return as a group. When the area allows, the program may also offer (at an extra fee) canoeing, kayaking or bicycling outings as well. 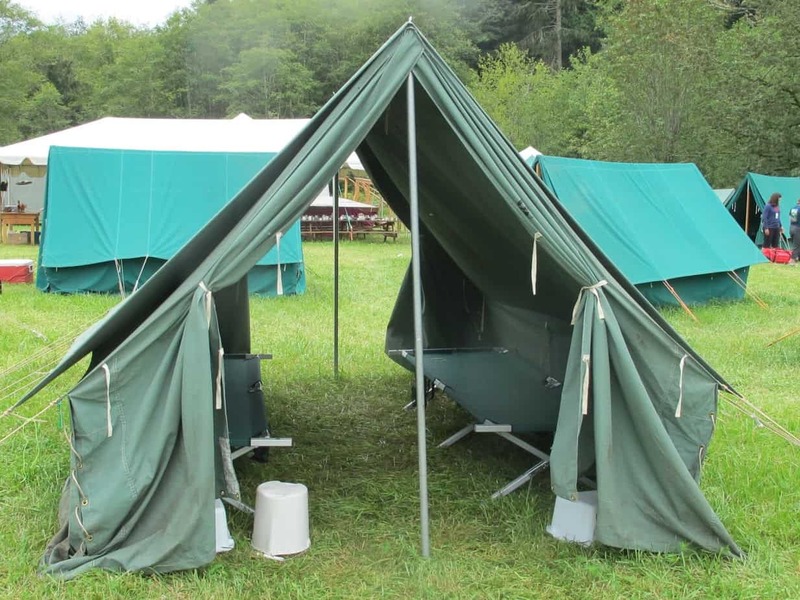 Campers share two-person wall tents, approximately 8’ x 10’, large enough to stand and walk around in, but without a floor. Generally, campers bring a tarp or small throw rug for the floor. The tents are equipped with two cots, two washbasins, and a water pail. Campers provide their own sleeping bags, full-length air mattresses or foam padding, and pillows. Drinking water will be available at camp. Shower stalls are provided for use with one’s own sun shower. Chemical toilets and hand-washing facilities will be provided at Camp. Three meals a day are provided for campers. Hot beverages are available an hour before breakfast and in the late afternoon before dinner. Breakfast and dinner are prepared and served by August Camp’s hired “Croo” under a dining pavilion. A variety of items are available for campers to prepare a trail lunch in the morning. August Camp accommodates vegetarian diets but not vegan diets. Vegetarian options often include tofu, pasta, and cheese. Gluten sensitive options are available. Lactose-free milk is available if you alert us on your registration form. If you have very specific dietary restrictions, you may need to bring some of your own food to camp. We are a “field kitchen” in a primitive setting and cannot accommodate individual food requirements/preferences. Campers may store a limited amount of personal food in an on-site secure, communal bear box. Happy hour is an August Camp tradition that enhances relaxation and camaraderie. Campers provide their own drinks and snacks. A campfire is held nightly. During this time campers report on the day hikes and leaders organize for the following day's activities. There are sometimes sing-alongs for interested campers. Each week organizes a "Follies" presentation where campers share their talents for music, poetry, dance, storytelling and comedy. All are welcome and encouraged to perform, no talent required.